For those of us who primarily blog about birds, June and July can often prove to be a little sparse. Thick vegetation obscures even the most persistent of investigations and once those fledglings have left the nest and their parents care, the whole family seems to go in to hiding. Even garden feeders that just a few weeks ago saw an almost unbroken line of visitors fall strangely silent. 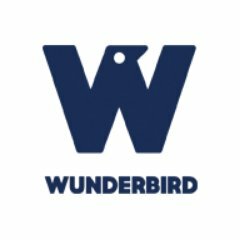 It's for these reasons that recent years have seen a huge upsurge in the number of people who, once considered as pure birders, have found themselves branching out into other areas of wildlife. Moths and butterflies have been two of the primary beneficiaries and I now count myself amongst those who are just as happy to spend a couple of hours exploring a meadow as they are scanning for migrants come the autumn. 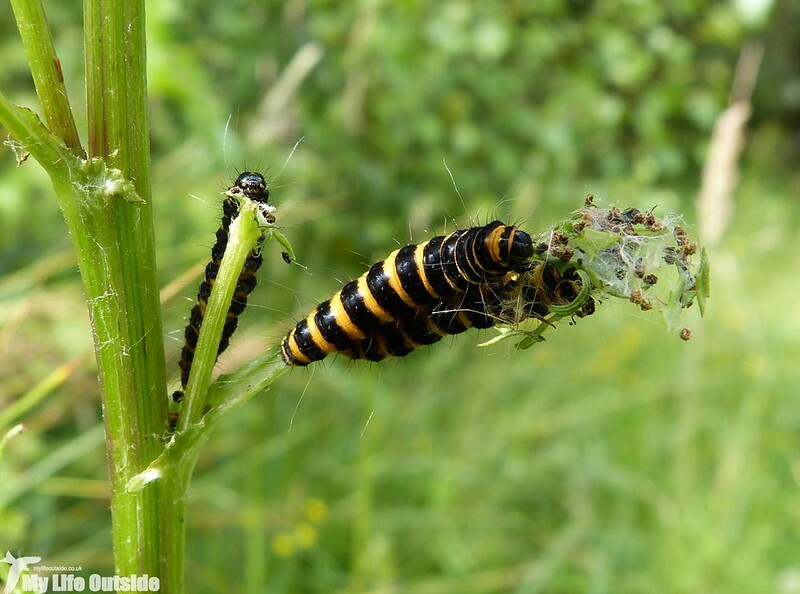 Though I have yet to go on a butterfly 'twitch' (despite those Purple Emperors looking mighty fine) there is one event that I always look forward to and that is the emergence of Cinnabar Moth caterpillars. I saw my first in our own back garden several years ago and since then no summer is complete without finding my first batch whether it be here on our local patch or slightly further afield. 2015 has seen that quest completed in spectacular style with huge numbers of these distinctive yellow and black critters spotted this week. First up were the individuals above which we found whilst exploring Lower Moor Farm in Cotswold Water Park. The Ragwort there was literally dripping with caterpillars and a full write up on the days other discoveries will be coming this weekend. It wasn't just England enjoying this bonanza however as an evening walk at Burry Port on Monday found the dunes again fit to bursting. Every scrap of Ragwort was covered with most plants already stripped entirely of their leaves. 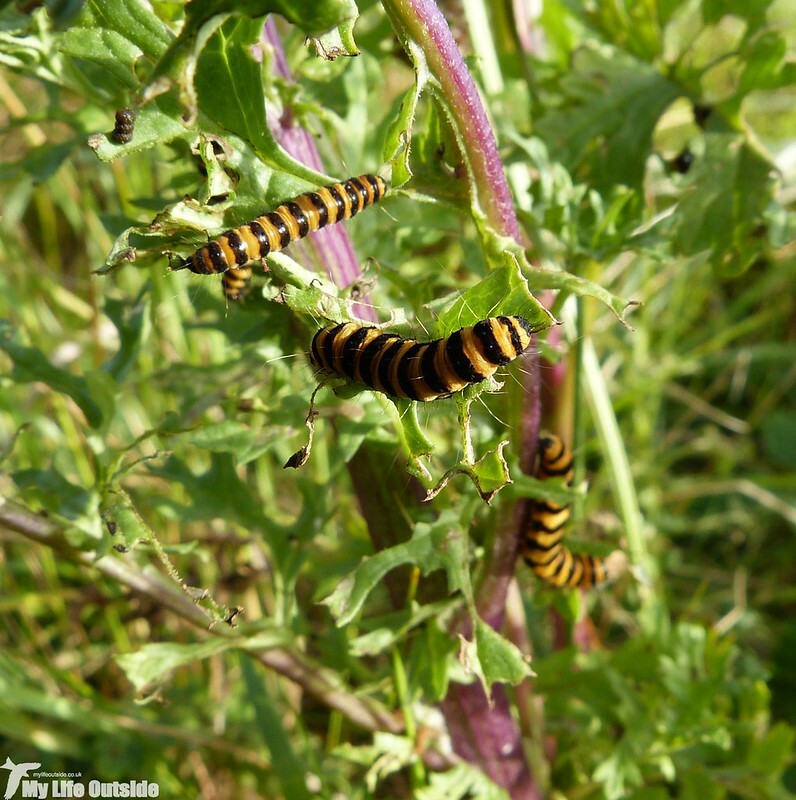 In the last six years I have never seen Cinnabar Moth caterpillars in such numbers which hopefully points to a decent boost in population for a species which has seen an 83% decline in the last thirty five years. Sadly I couldn't quite tell if the Ragwort currently lining the central reservation of the M4 between Swansea and Reading is proving to be equally as productive, though in retrospect that was probably for the best. Could have made for a rather interesting insurance claim. A week ago, we went on our (nearly) annual pilgrimage to Skomer (a wonderful nature island off West Wales for any non-locals reading this). Usually we go earlier in the year when the predominant colours are pink and blue (sea thrift, bluebells). But in late July, it had become yellow and white: chamomile (or mayweed? ), white campion and ragwort being the dominant flowering species around much of the circular coast path. 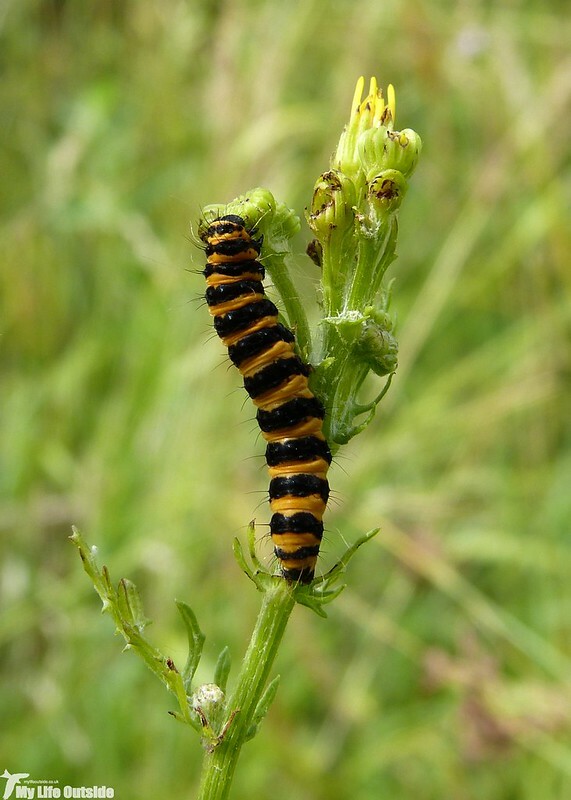 When I could take my eyes off the birds, I checked numerous ragwort plants for evidence of Cinnabar moth larvae. Nothing, not even nibbled leaves. Eventually, we found a small patch where a few plants had cinnabar larvae. And one had a Broom moth caterpillar. Odd. I swore I wouldn't take any more puffin pictures on this visit, and didn't take my DSLR. But I gave in to their charm and snapped a few on phone or compact and loaded 6 here: https://www.flickr.com/photos/paul_seligman_cardiff/tags/skomer2015/ - ragwort in the background of some!